Habit: Annual, biennial, glaucous, glabrous or sparsely hairy proximally. Stem: erect, (0.7)1.5--4.3(5.6) dm, branched distally. Leaf: rosetted, (1)3--8(15) cm, 2--3-pinnately lobed or divided, lobes linear to oblong, entire; middle, distal cauline sessile, (0.5)1--3(4) cm, ovate to cordate or +- round, deeply cordate-clasping, entire. Inflorescence: elongated; rachis glabrous. Flower: sepals 0.8--1(1.3) mm; petals 1--1.5(1.9) mm, 0.2--0.5 mm wide, narrowly spoon-shaped, pale yellow; stamens 6. Fruit: 3--4.5(5) mm, 3--4.1 mm wide, round to widely obovate, flat, tip winged, notch 0.1--0.3 mm; valves smooth, glabrous, not veined; style 0.1--0.4 mm, +- exserted beyond notch; pedicel generally spreading, 3--6(7) mm, cylindric, glabrous. Seed: 1.6--2.3 mm, ovate. Chromosomes: 2n=16. 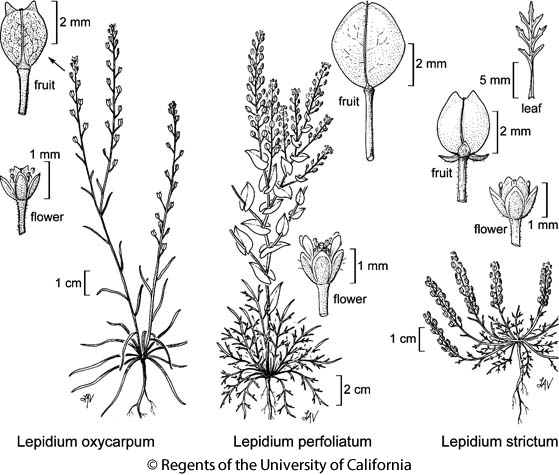 Citation for this treatment: Ihsan A. Al-Shehbaz 2012, Lepidium perfoliatum, in Jepson Flora Project (eds.) Jepson eFlora, http://ucjeps.berkeley.edu/eflora/eflora_display.php?tid=30555, accessed on April 20, 2019. NCoRI, CaR, n SNH, GV, SCoRI, GB, D; Markers link to CCH specimen records. Yellow markers indicate records that may provide evidence for eFlora range revision or may have georeferencing or identification issues. Purple markers indicate specimens collected from a garden, greenhouse, or other non-wild location.